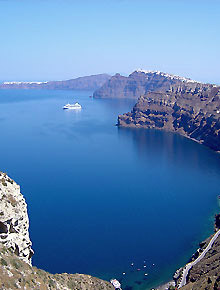 Akrotiri is famous for the lighthouse, the sunsets and the staggering views. You can find the beach below the Caldera by turning off before you reach the center of Akrotiri village. The beach is small and quiet, with deep cool waters, black sand with fantastic views of the volcano and the whole island. Akrotiri has wonderful taverns. There is another beach in the area that is also offers views of the Volcano and Caldera, Gialos beach, but it is really hard to get to. Once you navigate the half kilometer track, you will arrive at a beach with red rocks and black pebbles. 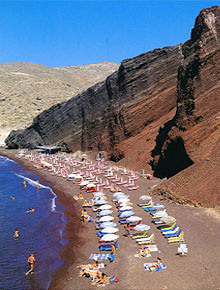 Red Beach ‘Kokkini Paralia’ was christened because of the steep red rock faced cliffs backing the beach. You have to park and walk for a few minutes to arrive at the beach. 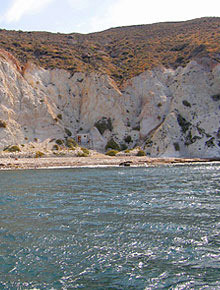 Further west you will come upon a white pebbled beach, the 'Aspri Paralia'. There are two ways to get to the beach, by boat or on foot. If you go towards the lighthouse, you will find a signpost pointing to a dirt road and of course Kambia beach. The beach has large pebbles and some umbrellas. Mesa Pigadia can be approached by following the dirt road going towards the lighthouse. There a couple of caves, very unusual rock formations and crystal clear water.